Hosted by the award-winning Franklin Park Conservatory and Botanical Gardens, the We Dig Ohio! Garden Summit is focused on growing the next generation of gardeners and will provide valuable information on community gardening and urban agriculture. 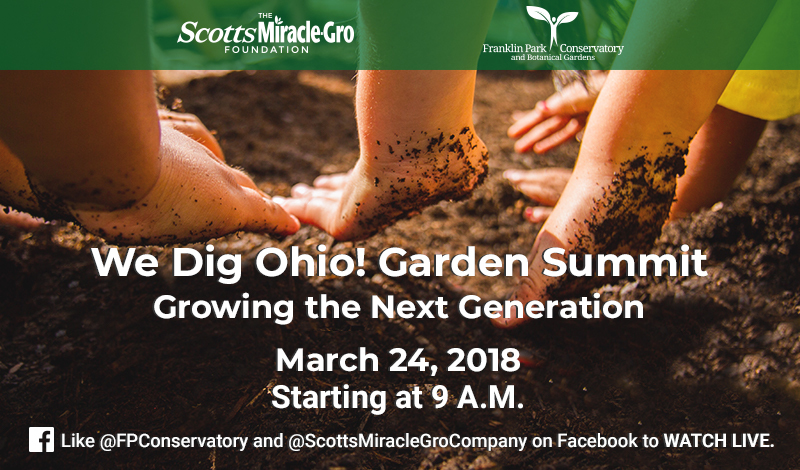 Partner organization, The Scotts Miracle-Gro Foundation, will share insights learned from their GRO1000 program and work with hundreds of garden groups across the country. Listen as The Scotts Miracle-Gro Foundation team shares inspirational wisdom from its work with hundreds of community garden groups across the country. Join leaders in the national youth gardening movement as they discuss national trends in empowering youth through garden-based learning. Like @FPConservatory and @ScottsMiracleGroCompany on Facebook to WATCH LIVE.